Prof. Neeraj Bhanot is an Assistant Professor in the area of Quantitative Methods and Operations Management. He pursued B.Tech in Mechanical Engineering and M.Tech in Industrial Engineering from Guru Nanak Dev Engineering College, Ludhiana along with MBA in Sales and Marketing from Indira Gandhi National Open University, New Delhi. Later, he completed his Ph.D. in the Department of Mechanical Engineering at IIT Delhi. He has been awarded Young Engineers Award in 2017 by Institution of Engineers India, Kolkata; Young Scientist Award in 2017 by Punjab Academy of Sciences, Patiala; Silver Medal for Research Paper based National Essay Competition in 2017by Indian Institution of Industrial Engineering; DST Travel Award in 2015 for International Conference in Australia; Best Paper Award in 2014 at NITIE-POMS International Conference and Gold Medal in 2013at university level for Master’s degree. He also serves as a Reviewer in various journals of international repute. His main research interests are Sustainable Supply Chain Management, Operations Management and Performance Benchmarking utilising Big Data Analytics, Artificial Intelligence, Internet of Things, etc. Along with this, he owns three copyrights as registered software and developed a website to generate awareness on sustainable manufacturing issues through gaming. Apart from academic involvements, he has been a National Level Pistol Shooter and won various medals at district and state level competitions. Smit: How did your journey begin? Prof. Neeraj: I owe all the learnings to my parents and teachers who have shaped me into what I am today. Their consistent support and guidance have helped me in refining myself and build a problem-solving approach. Moreover, being an Industrial Engineer, I consider this as an opportunity to tackle any industry based issues based on my skills that I have learned so far and due to this reason, I do not limit myself to manufacturing sector alone. After submitting my Ph.D. Thesis at IIT Delhi, I joined NIT-Jalandhar as Assistant Professor in July 2016. I was initially given the subject of “Industrial Engineering” (Elective Subject) to teach final year B.Tech students. I made it a point to include practical and live projects on a mandatory basis in that subject curriculum to provide a better understanding of the subjects to the students. Something unique about the elective subject over there was that it was open for final year B.Tech students of all the branches whether Mechanical, Electrical, Civil, Biotech, Computer Science, IT, etc., students were allowed to take that subject with a limit of 10 students from each branch. Thus, there were a total of approximately 90 students leading to the formation of 18 groups or so. So to make things interesting I asked them to make groups of 4-5 students such that each group consisted of students from different backgrounds ensuring a variety of skillsets. Thus, they were made to learn a lot of new techniques, modules, create frameworks, find out flaws in the existing way of doing things and generate new improved solutions and outcomes to complete their tasks. From 2016 to this date we have come to a long distance. Our achievements became contagious and more and more students joined. Currently, I am working with a lot of students from different universities and colleges like IIT Kanpur, NIT Jalandhar, GNDEC Ludhiana, etc. on various live projects utilising Artificial Intelligence, Big Data Analytics, etc. Smit: So how do you manage students from different universities? Prof. Neeraj: I consider myself very lucky having completed myPh.D.D under the able guidance of Prof. P.V. Rao and Prof. S.G. Deshmukh since, I got to learn many aspects of teaching and research from them. Even though Prof S.G. Deshmukh was also the Director of ABV-IIITM Gwalior at that time, he ensured his availability to me for effective guidance through Skype/Call/E-mail as and when needed. During that interaction, I learned the approach of guiding students effectively despite being in a different place like Sir used to manage his tasks. Hence, I too make myself available for my students with today’s developed softwares like Skype, Anydesk through which I can review their progress and current work from anywhere. This approach provides me a flexibility to manage all my tasks effectively since the idea is to be constantly there for them and not leaving them around hanging once the project starts or work is under progress. And without such commitment you cannot get desired results since, most of my students usually work on my defined projects and are expected to complete stage wise defined modules of the project utilising their skills. Smit: What are the major challenges you face while using this method of teaching with the students? Prof. Neeraj: Generally, every student who interacts with me is competent enough for doing projects, the biggest challenge is the time frame for doing them. On an average, they have to be done within 6-7 months. And an average term at an IIM is of 3-4 months so projects are carried forward with the same students in the next trimester or are to be given to the next junior upcoming teams. Moreover, when students commit for projects for the first time they are very high on excitement to do something big and better, but they are initially low on persistence and handling difficult situations. So whenever a difficult situation arises and work gets difficult for example along with the ongoing college work if they have to learn a new coding language, they are more likely to give up. So this is where my role as a Guide is of paramount importance. I keep the motivation up, facilitate them with the learning process and I keep them going. There are times when students get diverted with interests in multiple fields, so I have to be like a potter for them either shaping them softly or at times turning the heat on by being strict to them as per requirement. And the students after working over a problem for a long period of time are able to overcome the hurdles, and with this realisation, a change in behaviour and approach is generated. They understand that if you do something that is difficult and seemingly impossible for a longer period of time, it gets possible and you can overcome the hurdle. Bringing this behavioural change is one of the most difficult as well as a rewarding task. Because once that happens the team shows confidence and agility over any future endeavours. Smit: Students are already very busy with Cases and activities in an IIM, so how do you manage to apply the Project based Learning Process? Prof. Neeraj: Students are generally in the college from 9am to 5pm and stay back for some time for next day preparations. This is something that you don’t have a control on. It is the after-hours that you can capitalise on. The campus is also 17 kms away from the hostel so commutation is a hindrance as well. So for any field work to be done at sites e.g. talking about our recent SCM Projects done by students of IIM Amritsar on Golden temple or BRTS office or Cold Storages, etc., students used to manage their field visits as per the availability of free slots in their time table or after college hours either through personal conveyance or with available local transports. At times, I too used to accompany the students in their field visits to help them learn about extracting issues based on my understanding of the context. No doubt, it requires a lot of commitment because it hampers my work-life balance as well. But when you are ready to make sacrifices for them, students too get motivated and take work more seriously. Moreover, I have kept the projects currently specific to Amritsar only so that students can atleast visit them and try to understand in a more detailed manner. Smit: Can you please share about some of the projects that you have completed so far with the students at IIM-Amritsar as well as other universities so far? We analysed the whole chain learning about procurement of raw materials, storage, preparation, and distribution. The study reflects the love, selflessness, and dedication of the people, which makes it a unique and cherished one. Few issues were also observed in their supply chain which were suitably highlighted along with their addressal mechanism. This project has been covered online in “The Tribune” titled “IIM-Amritsar students carry out a study on community kitchen at Golden Temple”. We have observed that usually, very less number of people in Amritsar use BRTS services with most of the fleet of buses standing at the bus station without any further use. We found out the reasons for this via field visits and survey and did a future analysis of the project. We found out that during pilot runs people’s feedbacks were not taken into consideration, the ticket cost seems to be expensive for the people of Amritsar, the selection of the corridors for Busses in the centre makes it difficult for people to enter, exit and board the bus. Because of this reasons BRTS is making huge losses which can be used somewhere else for better facilities. This project has been covered online in “The Tribune” titled “Feedback mechanism must for BRTS success”. Cement industry is one of the largest tech savvy and capital intensive industry of our country. The process to make cement is neither easy nor cheap. On the other hand, the farmers have been found burning down their paddy crops and throwing away the ash. We proposed a framework for collecting this ash and utilise it for cement manufacturing process along with suitable micro-organisms (bacteria and fungus). The samples were tested for compressive strength, water absorption capacity and on the comparison, it was found better over traditionally manufactured cement. The biggest challenge though was to do it in such a way that it’s cost effective mutually for farmers and the cement industry. This too has been published online in “The Pioneer” titled “Why Burn when you can Earn”. The nodes in the supply chain in the agro products category is moving haphazardly in a different direction with no alignment along a common goal. So what every stakeholder in the supply chain needs to ensure is the value addition and value transfer that occur through the supply chain, along with technological integration using pre-coolers and refrigerated trucks which monumentally increase quality. It was also advised that the cold chain facilities become a bridge between the farmer & buyer becoming an avenue for end-to-end solutions. These are vital if we need to take the agricultural production into the next dawn of revolution as the time is upon us for the next sustainable green revolution. This article was also published online in “The Tribune” titled “The Chain Reaction”. Today for anyone interested in research, field data is available at a very vast scale. This is a boon as well as a challenge. Because for someone who is new to the field it gets very difficult to go through everything available. A normal person can go through 50-60 research papers or at most 100 if he is very enthusiastic about it but beyond that it’s not humanely possible due to time constraints. So a tool has been designed in Python which aims to help research scholars for carrying out detailed content analysis based on the available research database in any domain. This is a part of our copyright work titled “Program for Analyzing Key Trends in Research Data-set” with Registration No. SW-10310/2018. In a world pushing for phones with facial recognition and the Virtual reality, we are still taking attendance in India using either paper-pen, or at most bio-metric fingerprints, which is both time consuming and old-school. For this, an interface has been developed using JAVA which will ease the task of taking attendance with a large number of students present in the class as it compares the live image with the one available in the database and all detailed record is managed by the tool itself. This is also a part of our copyright work titled “A Digital Image Processing Based Attendance Assessment Framework” with Registration No. SW-10697/2018. Management scholars studying the cause and effect relationships between the indicators of any domain are usually constrained in the selection of indicators due to the large set of manual calculations and a small error can give the wrong flowchart for the same. So we created a programming tool such that managers can put in their survey inputs and do cause-effect analysis easily using more than enough indicators. The tool has been designed in Python which aims to help management scholars in easing their task of calculations for huge amounts of survey data while applying techniques such as Decision Matrix Trial and Evaluation Laboratory, Maximum Mean De-Entropy Algorithm and Interpretive Structural Modeling. This is also a part of our copyright work titled “Program for Identifying Cause and Effect Relationships between different Factors” with Registration No. SW-10923/2018. Apart from these, there are a lot more projects going on, currently with students of IIM-Amritsar at Amritsar level and soon as per our efforts and opportunities, we will take it forward in other cities of the state as well. Smit: One of the biggest issues with the industry today is stealing of IP, others ideas and taking false credit. When you are working with the best minds of the country, in an era of lost trust, how do you handle such problems? Prof. Neeraj: My Code of Conduct is simple and disciplined. Whenever I take a project with any student or a team I make sure to issue a legal document first, clearly mentioning what my role is in the project and what is the students’ role. So for any project either I take the lead position while students work with me and this is mentioned clearly in the legal documents signed by both of us and the credit for the project once completed is given accordingly. The other scenario is when the students are capable enough and they come up with new ideas of working on something and my job is just to be a facilitator. This scenario is also mentioned clearly in the legal document. So in both the cases neither me nor the students can deny each other’s role, keeping this WIN-WIN transparency over the years which has helped me and students to have warm working conditions. Everyone knows what their part is and what they will be expecting once the project is done. Nobody walks off disappointed. Projects and Cases are usually done everywhere in almost all B-schools around the country. But the kind of approach that is adopted by Prof. Neeraj Bhanot at IIM-Amritsar, is unique in its own way. The amount of on-field knowledge that is obtained by students in the live projects according to the varying roles that are assigned and are taken by them, allows them to grow personally and professionally. In today’s tech driven world where managers are available in bundles in every street and society, just going through the cases and completing the MBA/PGDM’s course outlines studying in AC rooms, is not enough. So at IIM-Amritsar such variety of approaches followed by Prof. Neeraj Bhanot, test and keep intact the technical skills and give an apt experience of ground realities and problems to students and teaches them how to solve or modify them. 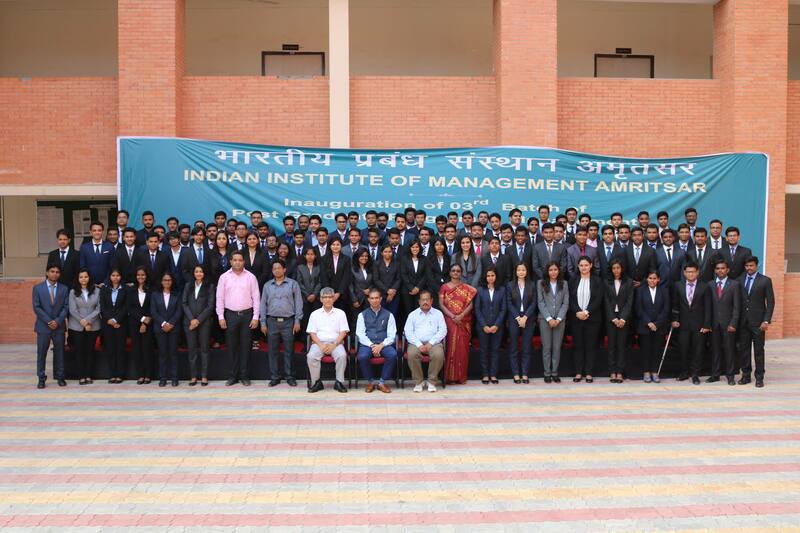 It in turn grooms the future managers of the country into versatile budding leaders. I thank Prof. Neeraj Bhanot for taking out time for the interaction and sharing the insights based on his projects based learning approach for the students.